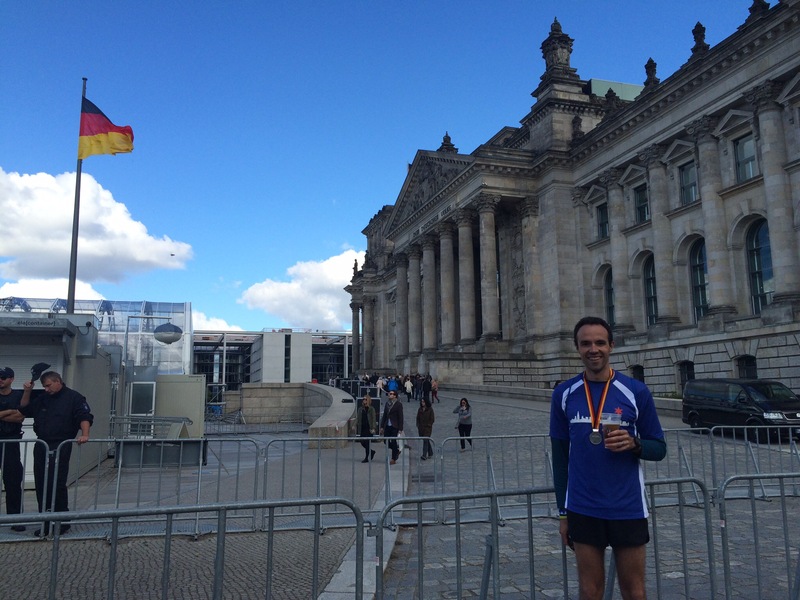 I walked calmly through the Berlin Tiergarten, a large, horizontal park that rests in the middle of the city, headed for Corral D and the start of the 2015 Berlin Marathon. There were runners around me but not as many as you would assume for a race that would soon have over 41,000 finishers. I was twitching a little, more from cold than nerves, though there were plenty of nerves. This was my target race for the year, the event that had dominated my workouts and preparation. 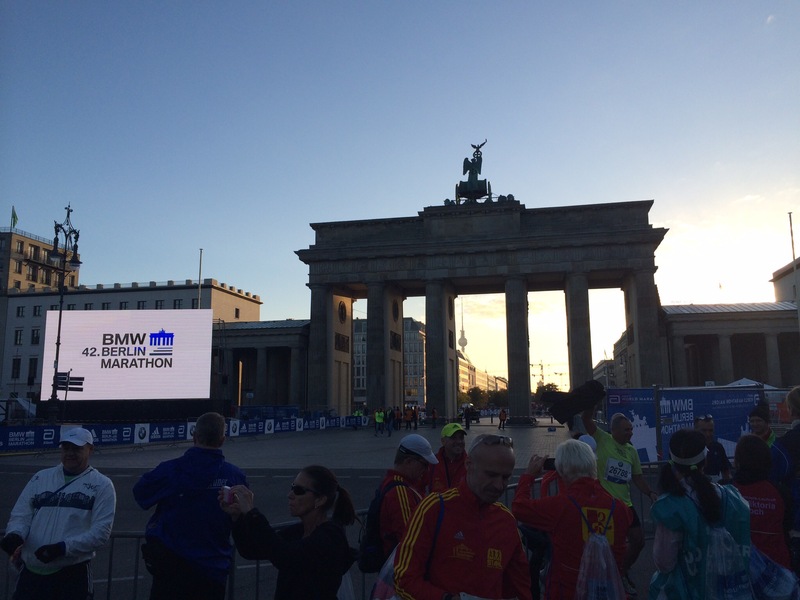 All roads led to Berlin, and the event name itself was the mantra I would whisper whenever I felt tempted to skip an early morning workout. After a banner year full of personal bests and absolutely no injuries, I was ready to dominate the course. Friends and family were tracking my splits, some even staying awake well into the night to watch my progress. 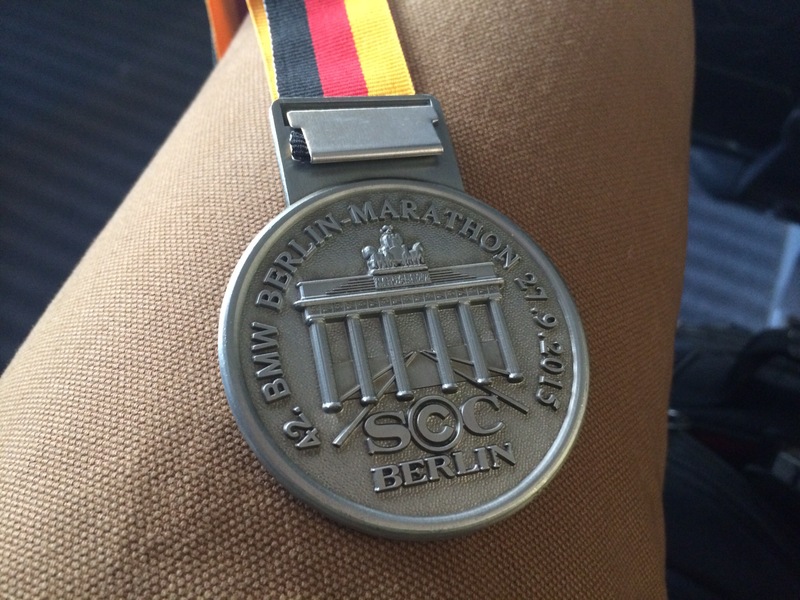 My first international marathon and third World Marathon Major had been hyped up considerably, and I was in no mood to disappoint anyone, least of all myself. A giant bubble of yellow balloons marked the start of the race. They rose into the faultlessly blue sky and disappeared over the trees of the Tiergarten. 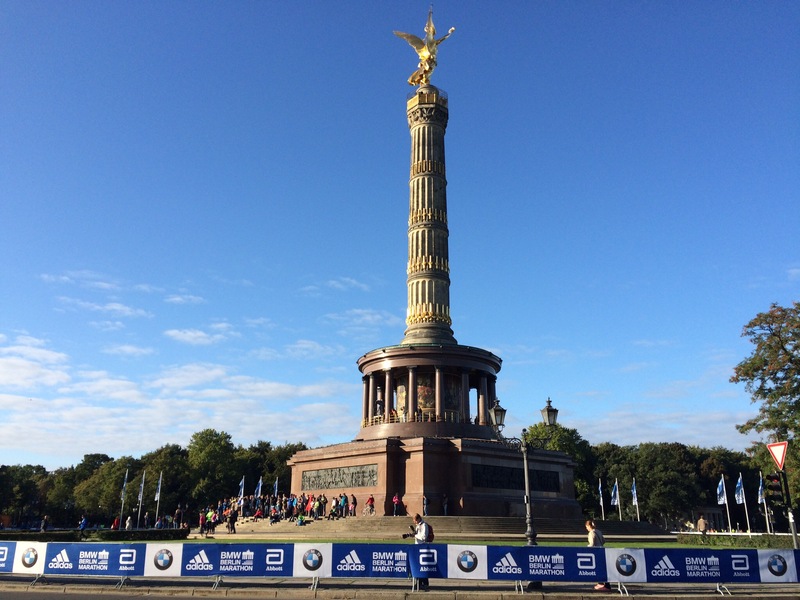 Just past the starting line was the Siegesäule (“Victory Column”), a large structure with a golden angel perched atop, around which we ran to the sounds of many spectators. We had about eight lanes to explore and jockey for position, but only one lane would occupy the streaks of blue painted earlier to indicate the tangents, or the quickest route possible. This was, after all, the world’s fastest course, where new world records are notched with astounding regularity. I quickly found these intermittent streaks and followed them, as if they were the footprints of favorite and eventual winner Eliud Kipchoge. In those first miles, I felt like I was running from pack to pack, nudging myself into the folds of a group of runners only to slowly part them by exploiting the human instinct to keep some personal space. It wasn’t long before the width of the course was halved and I became acquainted with the impressively international field (though we would later debate whether 90% of it was made up exclusively by Germany and Denmark). Aid stations came and went without much fanfare, which was one of the many subtle differences between this race and its American brethren. Big-city races portend imminent aid stations by loudly announcing them a few blocks early, with descriptions of what to expect. Here, I glanced right and realized I was mistaking a crowd of spectators with an aid station and immediately dashed to grab a drink. In fact, it was this unassuming character that led me to accidentally drink a mouthful of warm sweet tea, mistaking it for an energy drink. I don’t know what was more surprising, the unexpected flavor and temperature or that I really enjoyed it. Uncle Greg, who was a few corrals behind me, would later admit to mistaking the caffeinated beverages for warm apple juice before drinking four of them. The course itself was difficult to describe without giving a description of each mile. 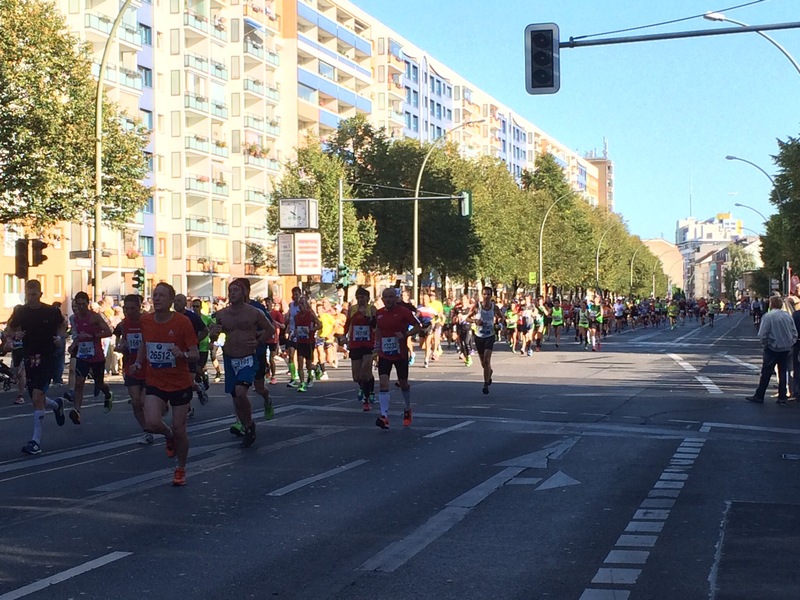 Whereas most races have discrete sections, Berlin felt like it would weave in and out of different parts of the city with a few unique stretches. Its course changed effortlessly from residential, tree-lined roads to large plazas with uniform architecture in just a few blocks. Large churches and museums would pop out as if from nowhere and with very few exceptions, all around us was the calming comfort of tree canopy. It wouldn’t be until the last 2 miles that the course experienced a material change. It kept its parks and city landscape so consistently that it would be very easy to lose one’s self in the race and simply watch the approaching trees and spectators. 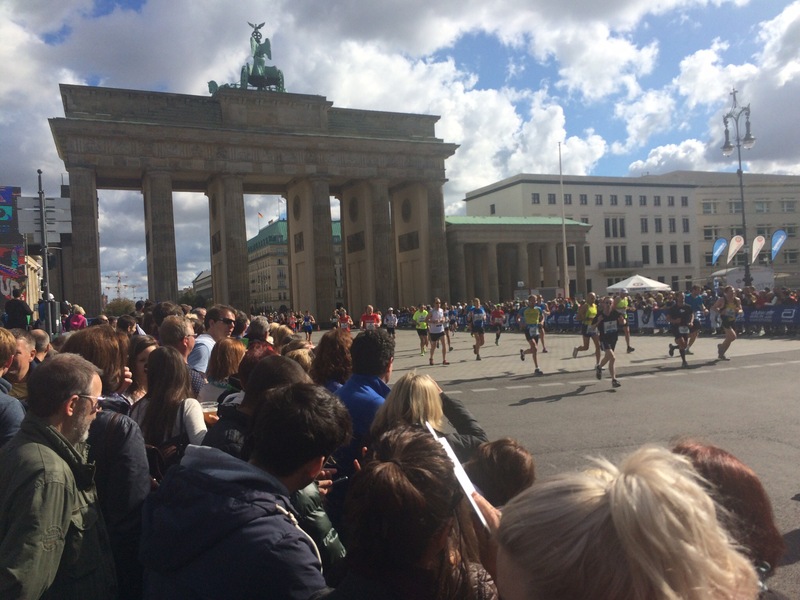 Once in the heart of the city, the course zigged and zagged through wide lanes until the Brandenburger Tor filled my sight, and from there it was a quick quarter mile to the finish. Spectators and loudspeakers tore through the streets with shrieks so piercing they could have pushed a dead man to the finish. Which was great, because I had been riding the struggle bus for a good ten miles by now. You may have noticed that I hadn’t said a word about my performance until now. The reason is, Sunday, September 27 was not my day. Despite a picture-perfect training cycle, I could not convert my peak fitness into a peak time. Maybe it was the Friday evening arrival, or the time on my feet Saturday, or the fact that I only slept 10 hours over three nights. Or, more likely, I picked a goal time (3:04) that was too ambitious, too far beyond my lactic threshold to convert to a winning time. I had even etched the time on the Abbott World Marathon Majors wall at the Expo the day before, quipping “BQ or Bust” underneath. And what a Bust it was. The first sign of trouble was literally half a mile in, where a tiny stitch in my stomach emerged to complain. It went away in a minute, but it gave me pause as I ran around the Siegesäule. Eight miles later, I ran past Steph, her sister Janine, aunt Mindy and uncle Scott, feeling confident and fast. But just two miles after that confident display, I came to the unfortunate realization that I was trying too hard. 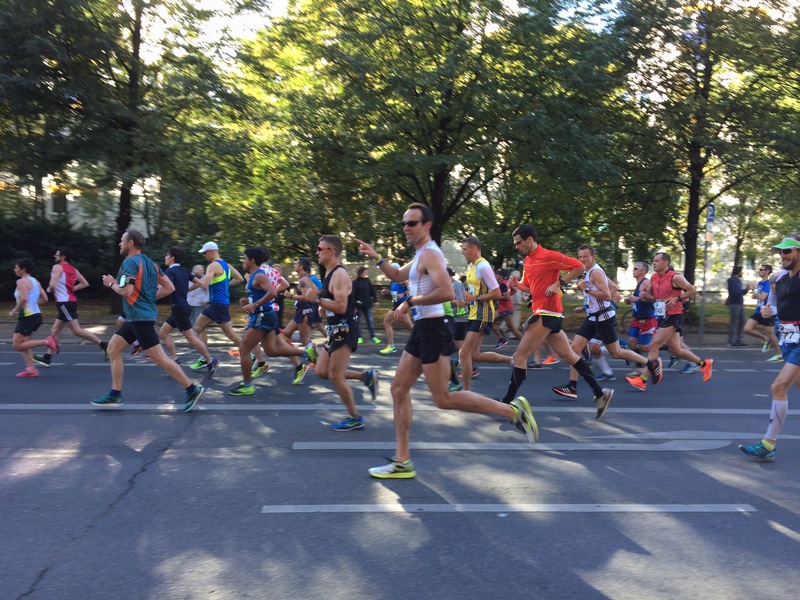 Ten miles into a marathon, you should still feel good, but I was increasingly gassed. Five miles later, I was on my last gear, which I don’t ever have to tap until miles 18-20. As I ran through the last miles, I had to choose which muscles to calm. If I ran, then my calves would seize up, but if I walked, then my lateral back muscles would tighten up into a fist of nerves. For large stretches of road, I had to run with my hand on my head, my elbow pointing to the sky. Later, my forearms would begin to generate the same high-voltage tension. It seemed that my muscles had decided to take on the shape of all the pretzels I had eaten in days prior. By the time I reached the finish line, I was almost thirty minutes late for my date with 3:04. 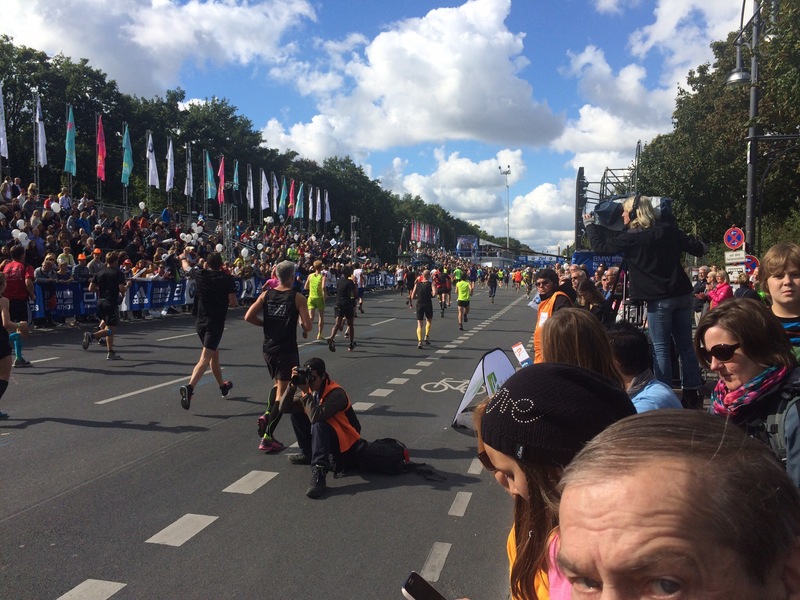 I had suffered through a spectacular bonk, one I had not experienced in many, many marathons. I unraveled completely, from my energy levels to my individual leg muscles, such that the world was a shimmering haze for much of the walk from the finish line to gear check. Although the race winner Eliud Kipchoge had to deal with his insoles falling out of his shoes around the same time that I bonked, his 2:04 world-leading time showed that he was able to convert the challenge into a formidable victory. And yet, it was not a complete disaster. I did finish, after all, earning a medal for my first overseas marathon, and in a respectable 3:31 time if you don’t see the laughably enormous positive split. And though my body was buzzing with tightness and fatigue, I wasn’t at all injured. I had given myself a few blocks during the race to mope about the situation. It baffled me that I couldn’t run at this pace for a marathon despite all indications suggesting I could, and I wasn’t thrilled at the prospect of starting all my responses to “How’d it go?” with “WELP …” But at the end of the day, I was in Germany with family, and I had to make up for the many beers I skipped during training. Plus, this was my 30th marathon. Over the years and that many races, I’ve learned to accept the cold fact that from training, to the taper and race-week nutrition, anything can happen. Sometimes it’s magic, sometimes it’s tragic. But I always find that, with a few exceptions, every finish line crossed is an accomplishment. And when just beyond that finish line is your loving wife with two beers, bratwurst and sauerkraut, then all memories of miles 18-24 vanish. For the first time in many years, I don’t have any pending race registrations. My future running plans are a blank canvas, ready to be filled with the next big goal. Maybe fast Majors aren’t my thing. I seem to do better in smaller races, where I can chase someone a block away and not have to constantly weave in and out of crowds. Or maybe that’s me making excuses again. The point is, there is another race out there, one that will get me that BQ, or at least nudge me closer to it. I just have to choose it, and tweak the master plan a bit to ensure that I stay strong and fast over every stride. 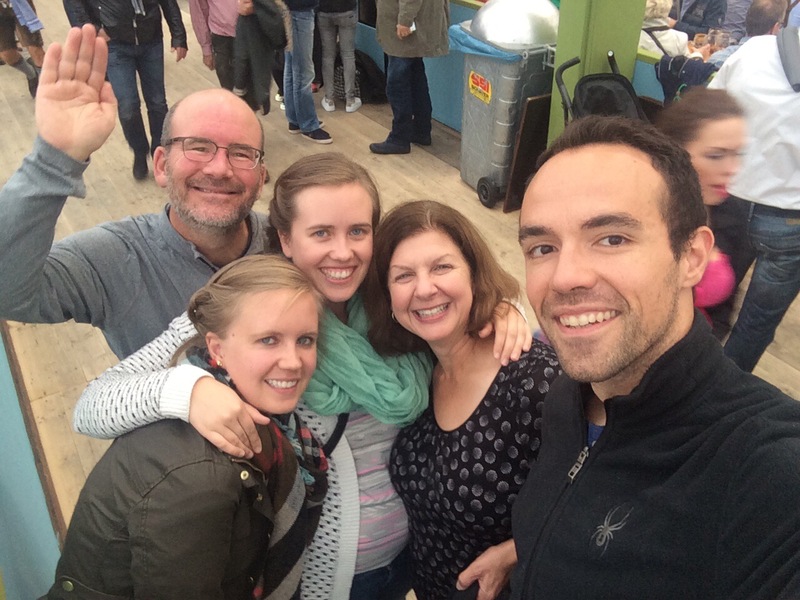 As for Berlin, I loved it. Every grimace, expletive and muscle spasm across the course was worth it. It annoys me that if I ever want to run it again, I have to subject myself to a lottery or pay through the nose for a packaged tour. But that is a problem for another time. For now, I have places to see and many delectable morsels of food to try. Ausgezeichnet!